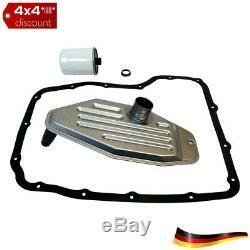 45rfe automatic transmission service kit (rbs626). All images can be orientative. 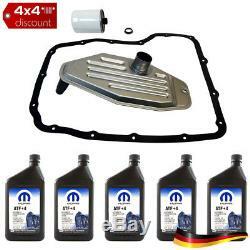 Automatic transmission service kit contains 2x filters including gaskets and 5 liters of mopar atf + 4 fluid. We do not deliver to the Canary Islands, Ceuta, Melilla, Madeira. 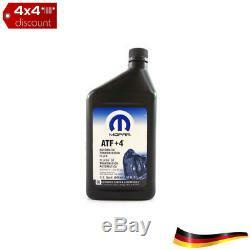 45rfe automatic transmission service kit. 45rfe transmission automática service kit. Replaces the number (s) oe. Atf4, 5013457, 5013457aa, 68218057, 68218057aa, 68218057ab, atf + 4, 5179267, 45rfefilkit, 45rfefk, 5179267ab, 5179267ad, 5179267ac. Please always check the list of discount 4x4 vehicles below the debay. Please always send us your chassis number if you are not sure! 2.5 l vm motori ohv. 3.7 l powertech v6. 3.9 l magmum v6. 4.7 l powertech v8. 5.2 l magnum v8. 5.9 l supercharged magnum v8. 3.6 l pentastar v6. 5.9 l cummins turbo diesel. 6.7 l cummins turbo diesel. 8.0 l magnum v10 (ohv). 8.3 l viper v10 (ohv). 3.0 l vm motori v6 (dohc). 3.0 l mercedes-benz v6. 3.1 l vm motori 531 ohv. 6.1 hemi v8 (srt-8). 6.4 l hemi v8 (srt-8). 2.5 l vm motori. 2.8 l vm motori (dohc). 3.8 l chrysler v6. If you are not sure if the part offered is adequate for your vehicle, contact us by email and send us the chassis number. We will make sure the part you are looking for fits 100% to your vehicle. Jeep®, chrysler®, dodge®, wrangler, cherokee, comanche, grand cherokee, order, liberty, patriot, compass, ram, dakota, durango, magnum, load, challenger, avenger, caliber, stratus, neon, intrepid, caravan, traveling, journey, 300, aspen, pacifica, town & country, sebring, pt cruiser, breeze, cirrus, concorde, new yorker, lhs, mmc raider, viper, nitro sind eingetragene marken der fca us llc und fiat. Rbs-handel und adler-teile stehen nicht im zusammenhang with chrysler und fiat. Artikelnummern werden nur zu vergleichszwecken verwendet. Zu keiner zeit soll der eindruck erweckt werden dass die von uns angebotenen artikel oem ware sind.